Kids can never seem to get enough of classic googly wiggle eyes! Hysterical massive SPOOKY BLUE giant wiggle eyes turn almost anything into a hilarious gag, Halloween or Christmas GHOST MONSTER SNOWMAN decoration. 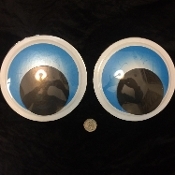 These BIG googly eyes are just like their smaller counterparts, only enormously larger!